Happy New Year to you all! I hope 2012 will be filled with happiness, joy, love and laughter. The photo above is from our home, we had a Christmas tree made from scrap wood this year. 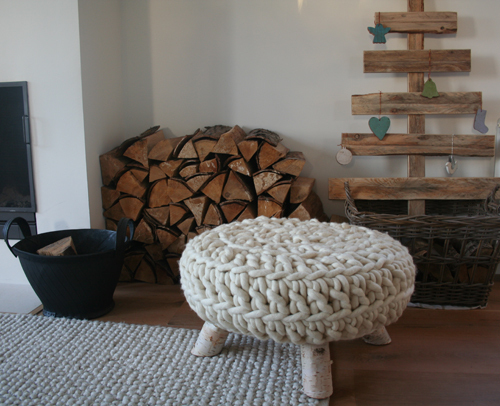 Update: the knitted pouf with birch stem legs is available from Le Souk. The tree is clever Danielle, but my eyes swivelled immediately to that wonderful stool – I have seen versions and love it! Note to self: learn crochet in 2012. Did you make it, or buy it, and if so, where please! A very happy and wonderful New Year to you, Danielle. The stool is quite pretty and I love it, too. I wish you a joyful, happy new year! I love your blog. Wishing you an amazing new year!!! Happy, healthy and loving New Year to all!